been sometimes preserved, the language and sentiments are generally extremely different. The character of Shakespeare’s Hamlet was wholly unsuited to the taste of a French audience. What is the great attraction in that mysterious being to the feelings of the English people, the strange, wild, and metaphysical ideas which his art or his madness seems to take such pleasure in starting, and the uncertainty in which Shakespeare has left the reader with regard to Hamlet’s real situation, would not perhaps have been understood — certainly not admired, by those who were accustomed to consider the works of Racine and Voltaire as the models of dramatic composition. In the play of Ducis, accordingly, Hamlet thinks, talks, and acts pretty much as any other human being would do, who should be compelled to speak only in the verse of the French tragedy, which necessarily excludes, in a great degree, any great incoherence or flightiness of sentiment. In some respects, however, the French Hamlet, if a less poetical personage, is nevertheless a more interesting one, and better adapted to excite those feelings which are most within the command of the actor’s genius. M. Ducis has represented him as more doubtful of the reality of the vision which haunted him, or at least of the authority which had commissioned it for such dreadful communications; and this alteration, so important in the hands of Talma, was required on account of other changes which had been made in the story of the play. 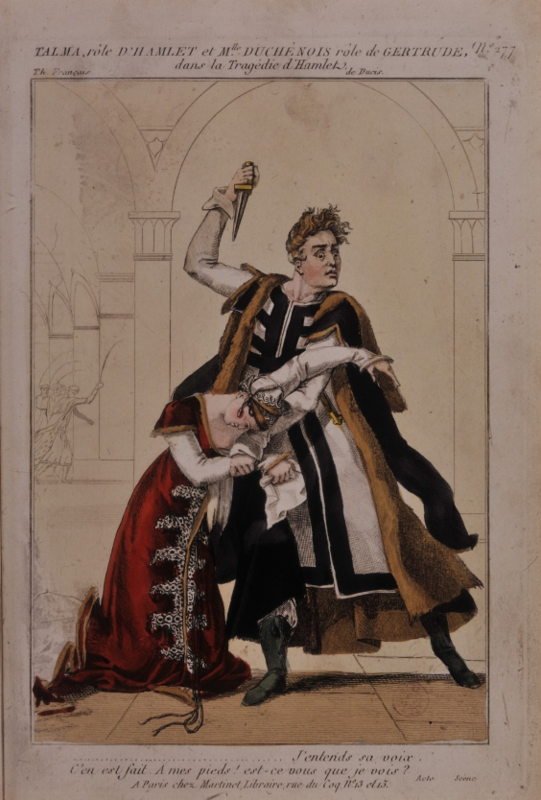 The paramour of the Queen is not Hamlet’s uncle, nor had the Queen either married the murderer, or discovered her criminal connexion with him. Hamlet, therefore, has not, in the incestuous marriage of his mother, that strong confirmation of the ghost’s communication, which, in Shakespeare, led him to suspect foul play even before he sees his father’s spirit. In the French play, therefore, Hamlet is placed in one of the most dreadful situations in which the genius of poetry can imagine a human being: Haunted by a spirit, which assumes such mastery over his mind, that he cannot dispel the fearful impression it has made, or disregard the communication it so often repeats, while his attachment to his mother, in whom he reveres the parent he has lost, makes him question the truth of crimes which are thus kid to her charge, and causes him to look upon this terrific spectre as the punishment of unknown crime, and the visitation of an offended Deity. Ducis has most judiciously and most poetically represented Hamlet, in the despair which his sufferings produce, as driven to the belief of an overruling destiny, disposing of the fate of its unhappy victims by the most arbitrary and revolting arrangement, and visiting upon some, with vindictive fury, the whole crimes of the age in which they live. There is in this introduction of ancient superstition, something which throws a mysterious veil round the destiny of Hamlet, that irresistibly engrosses the imagination, and which must be doubly interesting in that country where the horrors of the revolution have ended in producing a very prevalent, though vague belief, in the influence of fatality upon human character and human actions, among those who pretend to ridicule, as unmanly prejudice and childish delusion, the religion of modern Europe. The struggle, accordingly, that appears to take place in Hamlet’s mind is most striking; and when at last he yields to the authority and the commands of the spirit, which exercises such tyranny over his mind, it does not seem the result of any farther evidence of the guilt which he is enjoined to revenge, but as the triumph of superstition over the strength of his reason. He had long resisted the influence of that visionary being, which announced itself as his father’s injured spirit, and in assuming that sacred form, had urged him to destroy the only parent whom fate had left; but the struggle had brought him to the brink of the grave, and shaken the empire of reason; and when at last he abandons himself to the guidance of a power which his firmer nature had long resisted, the impression of the spectator is, that his mind has yielded in the struggle, and that, in the desperate hope of obtaining relief from present wretchedness, he is about to commit the most horrible crimes, by obeying the suggestions of a spirit, which he more than suspects to be employed only to tempt him on to perdition. No description can possibly do justice to the manner in which this situation of Hamlet is represented by Talma; indeed, on reading over the play some time afterwards, it was very evident that the powers of the actor had invested the character with much of the grandeur and terror which seemed to belong to it, and that the imagination of the French poet, which rises into excellence, even when compared with the productions of that great master of the passions whom he has not submitted to copy, has been surpassed by the fancy of the actor for whom he wrote. The Hamlet of Talma is probably productive of more profound emotion, than any representation of character on any stage ever excited. One other alteration ought to be mentioned, as it renders the circumstances of Hamlet’s situation still more distressing, and affords Talma an opportunity of displaying the effects of one of the gentler passions of human nature, when its influence seemed irreconcileable with the stern and fearful duties which fate had assigned to him. The Ophelia of the French play, so unlike that beautiful and innocent being who alone seems to connect the Hamlet of Shakespeare with the feelings and nature of ordinary men, has been made the daughter of the man for whose sake the king has been poisoned, and was engaged to marry Hamlet at that happier period when he was the ornament of his father’s court, and the hope of his father’s subjects. In the first part of the play, though no hint of the terrible revenge which he was to execute on her father has escaped, the looks and anxiety of Talma discover to her that her fate is in some degree connected with the emotions which so visibly oppress him, and she makes him at last confess the insurmountable barrier which separates them for ever. Nothing can be greater than the acting of Talma during this difficult scene, in which he has to resist the entreaties of the woman whom he loves, when imploring for the life of her father, and yet so overcome with his affection, as hardly to have strength left to adhere to his dreadful purpose. The feelings of a French audience do not permit the spirit of Hamlet’s father to appear on the stage: “L’apparition se passe, (says Madame de Stael), en entier dans la physionomie de Talma, et certes elle n’en est pas ainsi moins effrayante. Quand, au milieu d’un entretien calme et melancohque, tout a coup il aperçoit le spectre, on suit tout ses mouvemens dans les yeux qui le contemplent, et l’on ne peut outer de la presence du fantome quand un tel regard l’atteste.” The remark is perfectly just, nothing can be imagined more calculated to dispel at once the effect which the countenance of a great actor, in such circumstances, would naturally produce, than bringing any one on the stage to personate the ghost; and whever has seen Talma in this part, will acknowledge that the mind is not disposed to doubt, for an instant, the existence of that form which no eye but his has seen, and of that voice which no ear but his has heard. We regretted much, while witnessing the astonishing powers which Talma displayed in this very difficult part of the play, that it was impossible to see his genius employed in giving effect to the character of Aristodemo, (in the Italian tragedy of that name by Monti), to which his talents alone could do justice, and which, perhaps, affords more room for the display of the actor’s powers, than any other play with which we are acquainted. But the soliloquy on death is the part in which the astonishing excellence and genius of Talma are most strikingly displayed. Whatever difficulty there may often be to determine the particular manner in which scenes, with other characters, ought to be performed, there is no difference of opinion as to the manner in which soliloquies ought in general to be delivered. How comes it, then, that these are the very parts in which all feel that the powers of the actors are so much tried, and in which, for the most part, they principally fail? No one can have paid any attention to the English stage, without being struck with the circumstance, that while there may be much to praise in the performance of the other parts, many of the best actors uniformly fail in soliloquies; and that it is only of late, since the reputation of the English stage has been so splendidly revived, that we have seen these difficult and interesting parts properly performed. It is in this circumstance, more than any other, in which the talents of Talma are most remarkably displayed, because he is peculiarly fitted, by his complete personation of character, and the deep interest which he seems himself to take in the part he is sustaining, to excel in performing what chiefly requires such interest. He is, at all times, so fully impressed with the feelings, which, under such circumstances, must have been really felt, that one is uniformly struck with the truth and propriety of every thing he does; and of course, n soliloquies, which must be perfect, when the actor appears to be seriously and deeply interested in the subjects on which he is meditating, Talma invariably succeeds. In this soliloquy in Hamlet, he is completely absorbed in the awful importance of the great question which occupies his attention, and nothing indicates the least consciousness of the multitude which surrounds him, or even that he is giving utterance to the mighty thoughts which crowd upon his mind. “Talma ne faisoit pas un geste, quelquefois seulement il remuoit la tête pour questioner la terre et le ciel sur ce que c’est que la mort! Immobile, la dignite de la meditation absorboit tout son etre.” We could wish to avoid any attempt to describe the acting of Talma in those passages which the eloquence of M. de Stael has rendered familiar throughout Europe; yet we feel that this account of the tragedy of Hamlet would be imperfect, if we did not allude to that very interesting scene, which corresponds, in the history of the play, to the closet scene in Shakespeare. Talma appears with the urn which contains the ashes of his father, and whose injured spirit he seems to consult, to obtain more proof of the guilt which he is to revenge, or in the hope that the affections of human nature may yet survive the horrors of the tomb, and that the duty of the son will not be tried in the blood of the parent who gave him birth. But no voice is heard to alter the sentence which he is doomed to execute; and he is still compelled to prepare himself to meet with sternness his guilty mother. After charging her, with the utmost tenderness and solemnity, with the knowledge of her husband’s murder, he places the urn in her hands, and requires her to swear her innocence over the sacred ashes which it contains. At first, the consciousness that Hamlet could only suspect her crime, gives her resolution to commence the oath with firmness; and Talma, with an expression of countenance which cannot be described, awaits, in triumph and joy, the confirmation of her innocence, — and seems to call upon the spirit which had haunted him, to behold the solemn scene which proves the falsehood of its mission. But the very tenderness which he shews destroys the resolution of his mother, and she hesitates in the oath she had begun to pronounce. His feelings are at once changed, — the paleness of horror, and fury of revenge, are marked in his countenance, and his hands grasp the steel which is to punish her guilt: But the agony of his mother again overpowers him, at the moment he is about to strike; he appeals for mercy to the shade of his father, in a voice, in which, as M. de Stael has truly said, all the feelings of human nature seem at once to burst from his heart, and, in an attitude humbled by the view of his mother’s guilt and wretchedness, he awaits the confession she seems ready to make: and when she sinks, overcome by the remorse and agony which she feels, he remembers only that she is his mother; the affection which had been long repressed again returns, and he throws himself on his knees, to assure her of the mercy of Heaven. We do not wish to be thought so presumptuous as to compare the talents of the French author with the genius of Shakespeare, but we must be allowed to say, that we think this scene better managed for dramatic effect: and certainly no part of Hamlet, on the English stage, ever produced the same impression, or affected us so deeply. We are well aware, however, how very different the scene would have appeared in the hands of any other actors than Talma and Madle. Duchesnois, and that a very great part of the merit which the play seemed to possess, might be more justly attributed to the talents which they displayed. At the conclusion of this great tragedy, which has become so popular in France, and in which the genius of Talma is so powerfully exhibited, the applause was universal; and after some little time, to our surprise, instead of diminishing, became much louder; and presently a cry of Talma burst out from the whole house. In a few minutes the curtain drew up, and discovered Talma waiting to receive the applause with which they honoured him, and to express his sense of the distinction paid to him. Comments: Archibald Alison (1792-1867) was a Scottish lawyer and historian, author of the ten-volume History of Europe from the Commencement of the French Revolution in 1789 to the Restoration of the Bourbons in 1815 (1833-1843). Jean-François Ducis helped introduce Shakespeare to the French through adaptations of the plays in which elements of the plot were sometimes radically altered. His adaptation of Hamlet was made in 1760. Ducis’s adaptations were billed under his name rather than Shakespeare‘s. François-Joseph Talma performed in a number of Ducis’s adaptations. Hamlet’s mother was played by Joséphine Duchesnois. 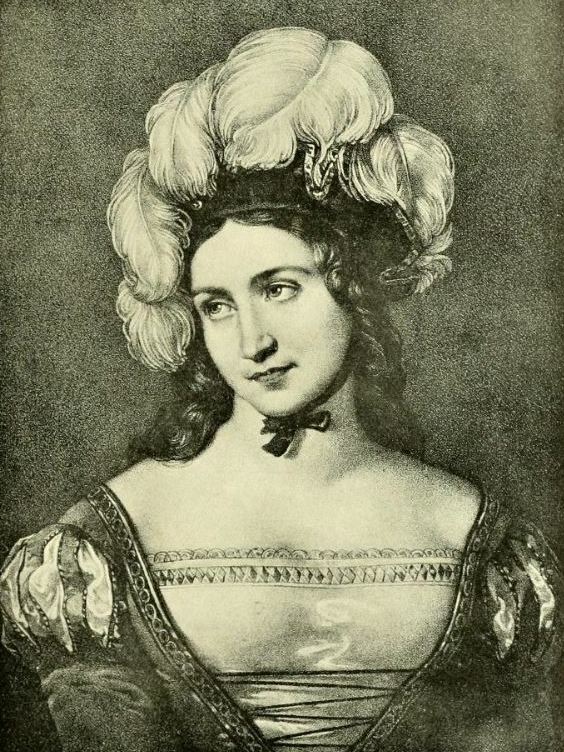 Madame de Staël wrote about Talma’s Hamlet in De l’Allemagne (1813).